In J4: The Magritte Jay realizes he’s a little too high and steps out for some fresh air. While he’s outside a cloud shaped like a fox steps from the sky to talk to him. This is Faith, who was struck by lightning and died. 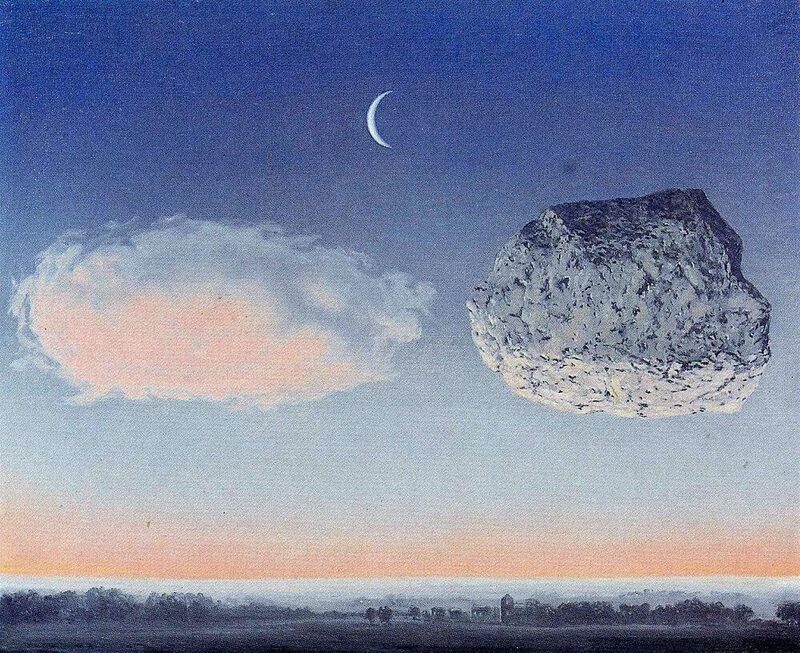 Magritte’s brand of experimental modernism is entrancing. His impeccable symbolic style influenced Pop Art of the 1950s. I’m not an artist (just check any section of Akayama DanJay) or an art historian or anything like that, but I do have art-critic Robert Hughes’ introduction to The Portable Magritte to vouch for me in Magritte’s applicability to the story I’m trying to tell. Magritte’s turning point was 1927, when he went to live in Paris. There, immersed in the Surrealist movement, he was no longer a provincial spectator. And he quickly realized where his contribution to it might lie… in hallucinatory ordinariness. …Magritte’s combinations [of ordinary objects] were another thing entirely. His poetry was inconceivable without the banality it worked on and worked through: it subverted ordinary naming. The canvas on the easel bears a picture of the view through the window, and this picture exactly overlaps the view, so that the play between “image” and “reality” inside the fiction of Magritte’s image asserts that the real world is merely a construction of the mind. When I look at that painting, my first question is “does the picture on the canvas accurately reflect the real view through the window?” This is precisely the trap Magritte has laid: there is no real view through the window. It’s a painting. In the same way, we might try to “peek around” our sensory perceptions to glimpse reality as it truly is, but that glimpse would necessarily be filtered through sensory perception. No matter how hard we try, we cannot wrangle objective reality. The fact of these words on your screen is filtered through your mind, which lies to you every night when you dream. If there exists something called an “I” it is a bubble of lies which pops when self-observed. Akayama DanJay begins with Dan dying and touring the afterlife. When he is obliterated, he returns as Jay. Is Jay’s memory of being Dan a dream? Is Dan’s experience as Jay illusory? The continuity of the DanJay’s consciousness across the afterlife and back is my attempt to reproduce, in writing, the effect of Magritte’s The Human Condition. Which parts of DanJay’s experience are real? Are his hallucinations a greater reality than his perceptions of waking life? Of course not! Akayama DanJay is fiction. None of it is real! Our mind betrays us in imagining reality when there can be no such thing. Not everything in Akayama DanJay is ordinary. Crickets grow like grass from the ground. A bird-monster scours the afterlife. But the characters don’t treat crickets as unordinary, and the bird-monster appears only in hallucinogenic stupors. I hope to blend the normal and the weird so thoroughly that the reader never knows what to expect. When the characters are supposedly sober, they see congregations of monks worship a pink penguin. When the characters hallucinate, anything goes, yet their visions have internal consistency. Anyway, that’s why I mentioned Magritte. Even my crude artwork sometimes echoes his composition and themes. I hope this was interesting, because I’m grasping for ideas to write about as commentary. I don’t have much writing advice because I mostly wing it. Maybe I’ll just talk about one of my inspirations every week! See you next Friday. Keep eating your worms!